Adding the Audits panel and powering it by Lighthouse was a good move by the Chrome team. 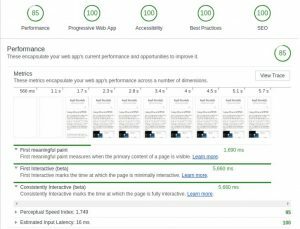 It is easier than ever to get a basic check on how well web apps are performing according to pre-defined settings for network and cpu throttling. It also has general mobile emulation. 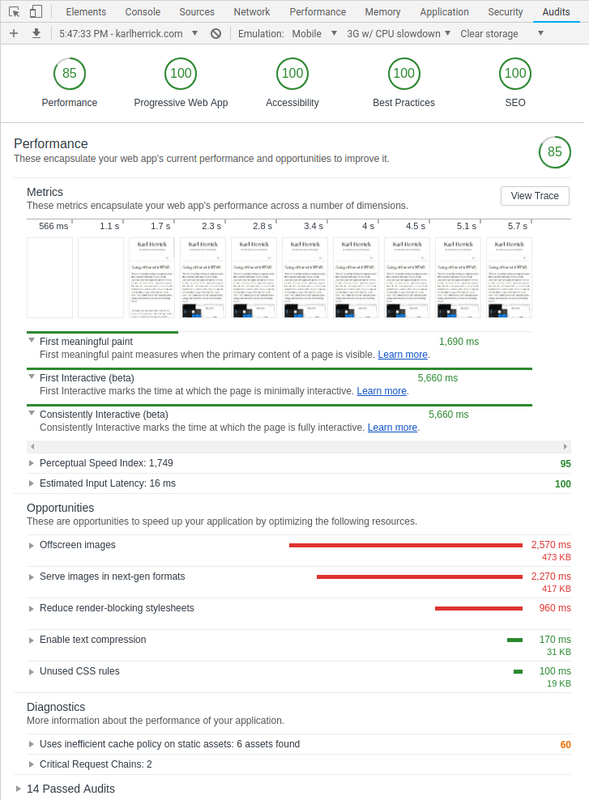 Although there is certainly room for improvement on this site (hosting it closer to where it gets the most traffic from and work on optimizing images would be logical next steps for more performance gains) the initial results seem promising. You can also run it from the command line, so I thought it might be interesting to get it setup on top of the minimal continuous integration pipeline I have implemented on Docker and Travis CI. For more information, a good resource to start learning is the Introduction to Progressive Web App Architectures on Google Developer’s Web Fundamentals page.